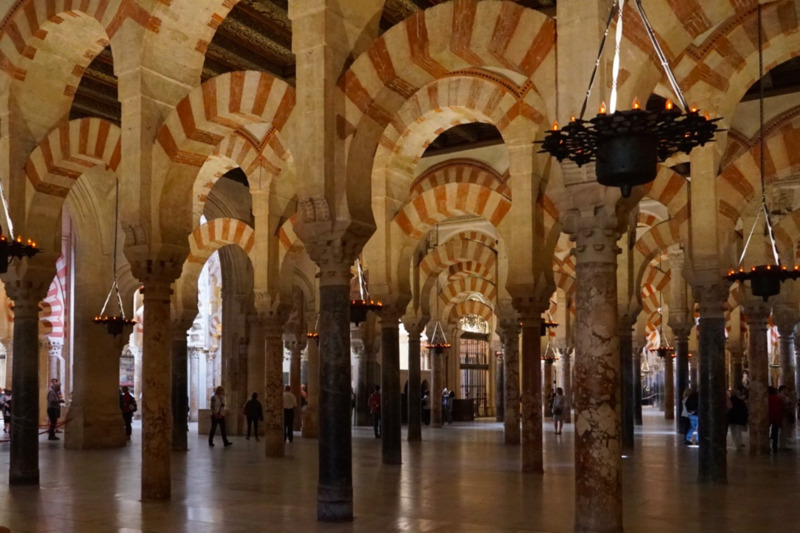 One of the things that I highly recommend while in southern Spain is to visit Cordoba to experience the city and, of course, to see the stunning Mezquita. 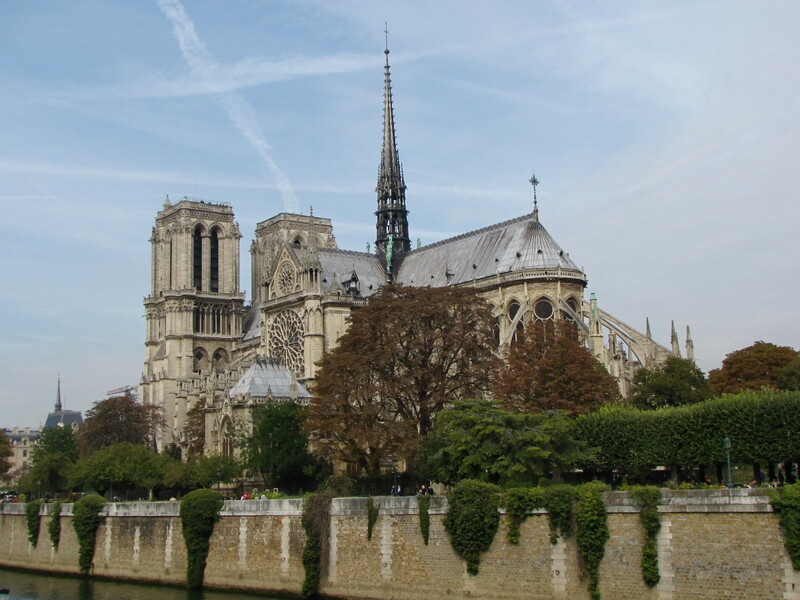 This Mosque and Christian Cathedral represent a once-in-a-lifetime opportunity to see two great religions of the world blended into one incredible structure. But, while the Mezquita is the ultimate destination for most visitors to Córdoba, there is so much more to see while here. The unique architecture of Cordoba’s narrow streets, particularly in its historic Jewish quarter, provides visitors a chance to experience the typical Spanish look mixed with an obvious Moorish influence. It makes for an incredible experience that should not be missed. If you are using Seville as a base for a period of time, Cordoba is an easy day trip that can be done with no stress and little planning. The hi-speed train system in Spain is one of the best in Europe and makes it extremely easy to get from Seville to Cordoba. Trains run pretty much all day, and we simply walked up to the ticket counter at the Santa Justa Train Station and purchased 4 tickets for the next train to Cordoba. 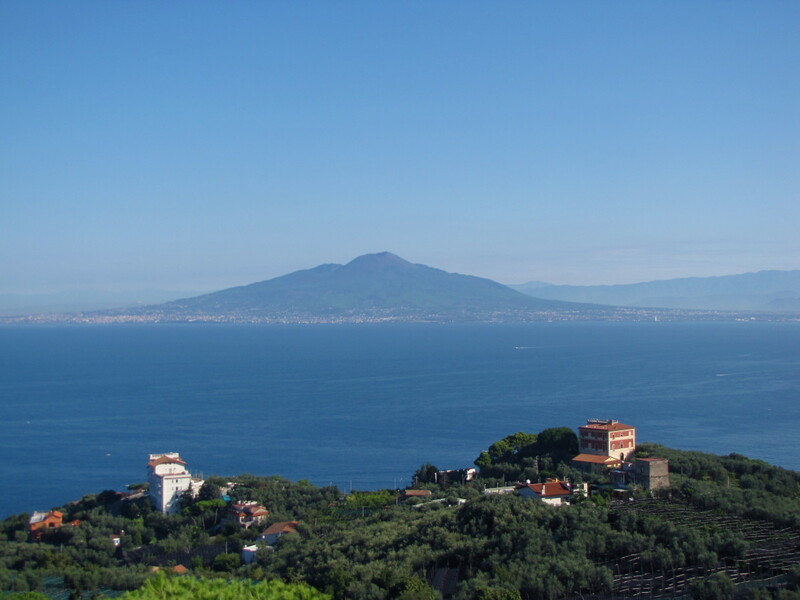 The hi-speed train takes just 45 minutes to make the journey, and before you know it, you are at the doorstep of this amazing UNESCO World Heritage Site. You can also opt for one of the slower regional trains, which have lower fares and take about 75 minutes to make the journey. Fares for the Renfe hi-speed train will vary depending on what time you depart but expect about 20 to 25 euro each way. The regional train fare will run about 13 to 15 euro. Advance tickets for visiting the Mezquita are not available, so upon arrival, you will have to queue up with everyone else for your tickets. But, if you want to skip the ticket line just be sure to bring enough euros with you and you can use the kiosk ticket machines that are located just to the left of the ticket line. The machines don’t accept credit cards, but at just 10 euro per ticket, paying cash is a great way to save some time. In our case, the ticket line was a good 30 minutes and we had our tickets in less than 2 minutes using the kiosk. As you enter the Mezquita, you will immediately notice what it is world renowned for—its amazing columns that seem to stretch to infinity. 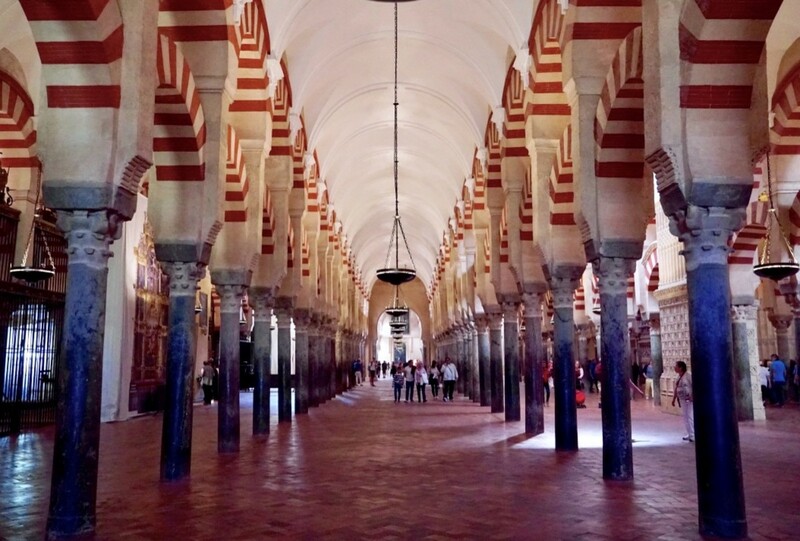 The 856 red-and-white, arched columns are the defining architectural element of the Mezquita, and its mammoth size makes it the world’s largest mosque. Built in 784, the great mosque was converted to a Roman Catholic Church in 1236, following the Christian conquest of Cordoba. 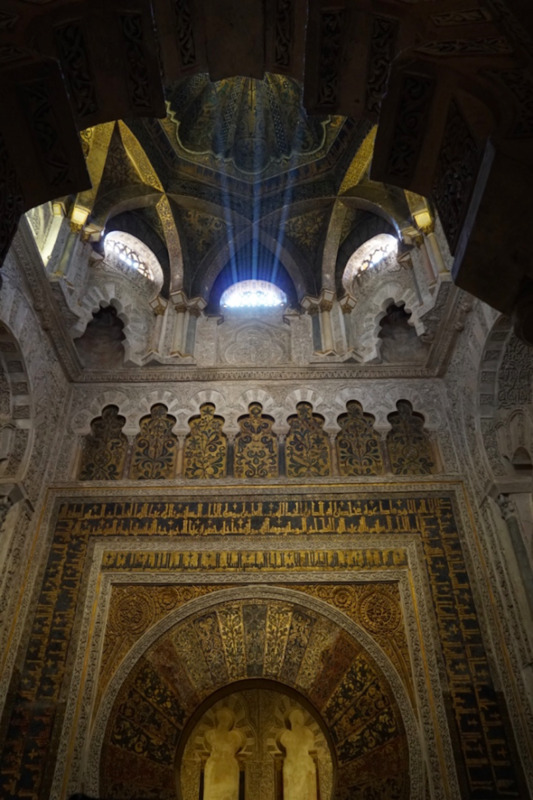 By retaining its Moorish origins, the Mezquita has become a symbol of tolerance and acceptance by blending two of the world’s great religions into one amazing structure. 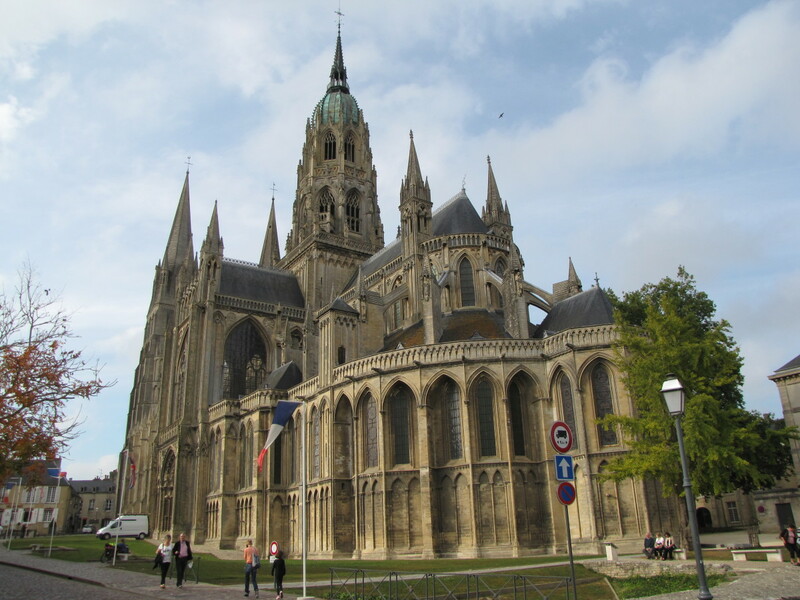 The cathedral is strategically placed in the middle of the mosque, and upon discovering it, I think you will be awestruck at the beautiful detail of the altar and the adjacent choir stalls. While the cathedral is certainly stunning, the mosque also contains some amazing architectural elements. The mihrab, or prayer niche, is a work of art with beautiful mosaics covering the horseshoe-shaped arch. The mosaics rise toward the eight-point dome where skylights share the sun's golden rays in spectacular fashion. A mihrab is a niche in the wall of a mosque that usually points toward Mecca. 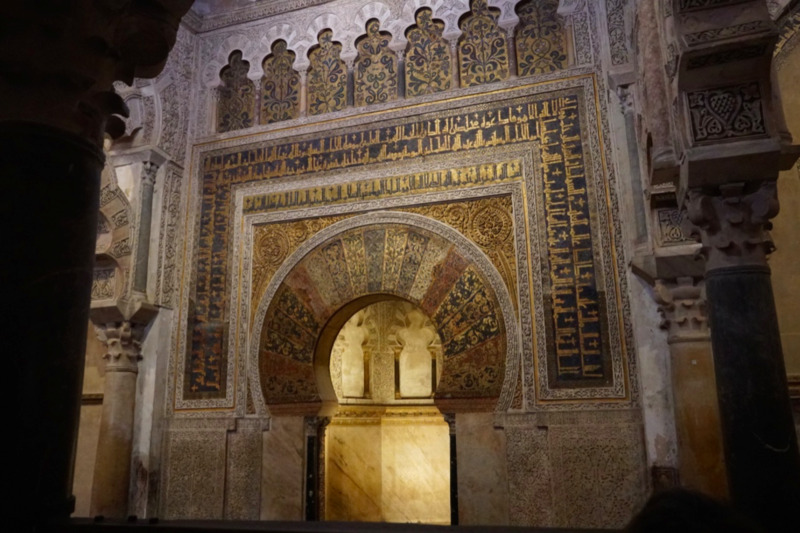 Interestingly, the horseshoe arched mihrab of the Mezquita points south, not southeast, which is the direction of Mecca. After visiting the mosque and cathedral, be sure to roam the Court of Oranges for some great photos of the Bell Tower. The courtyard is a great place to sit and relax in the shade of the orange trees while absorbing the significance of what you have just experienced. 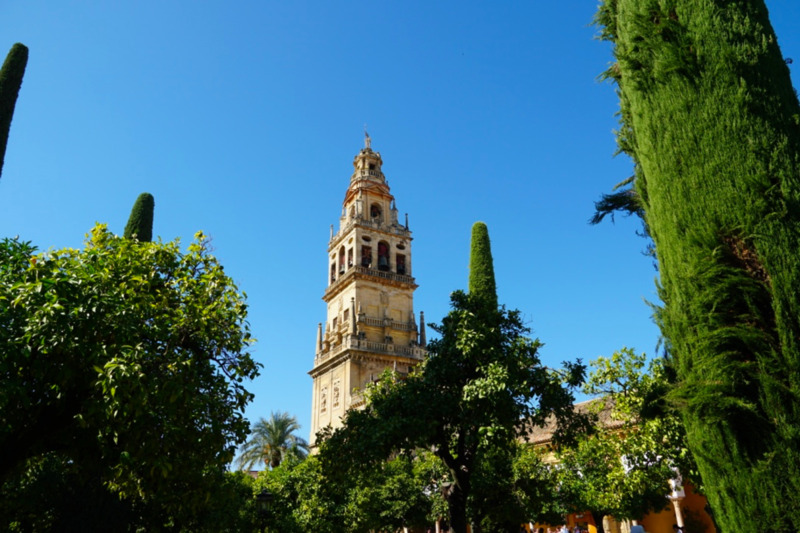 The Bell Tower, which is the tallest structure in Cordoba at 54 meters, can be climbed for the reasonable fee of just 2 euros and provides great views of Cordoba. 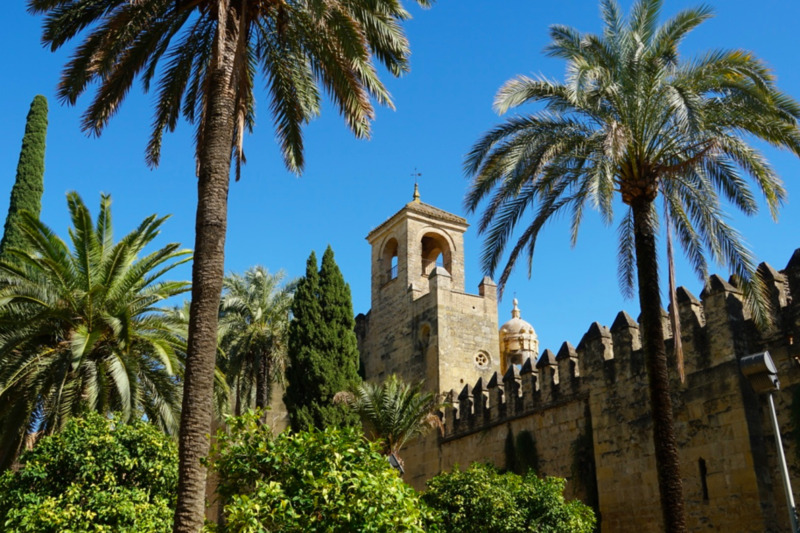 Expect to spend at least a couple of hours to tour the Mezquita, Courtyard, and Bell Tower. 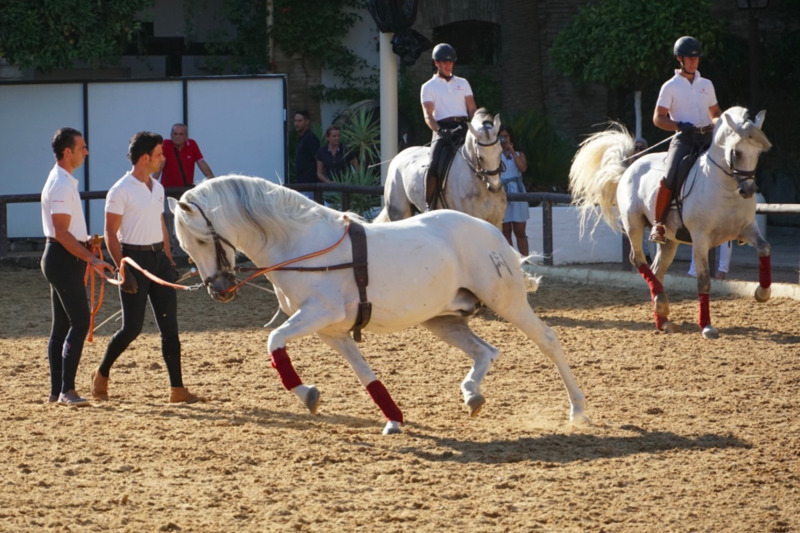 While most visitors to Cordoba will rightfully flock to the Mezquita, we had time to explore the town and spent a relaxing hour or so at the Royal Stables watching the beautiful Andalusian Horses practice for their nightly show. While I’m sure the equestrian show is wonderful, at 9 pm it was too late for us as we had to catch the train back to Seville. But, for just 5 euro you can gain entry to the stables, the carriage museum, and watch these beautiful horses practicing. The museum contains a number of carriages used over the centuries and is just part of the beautiful grounds here. Feel free to sit and watch the practice session or take it all in while walking the grounds where you can interact with the horses up close and personal. 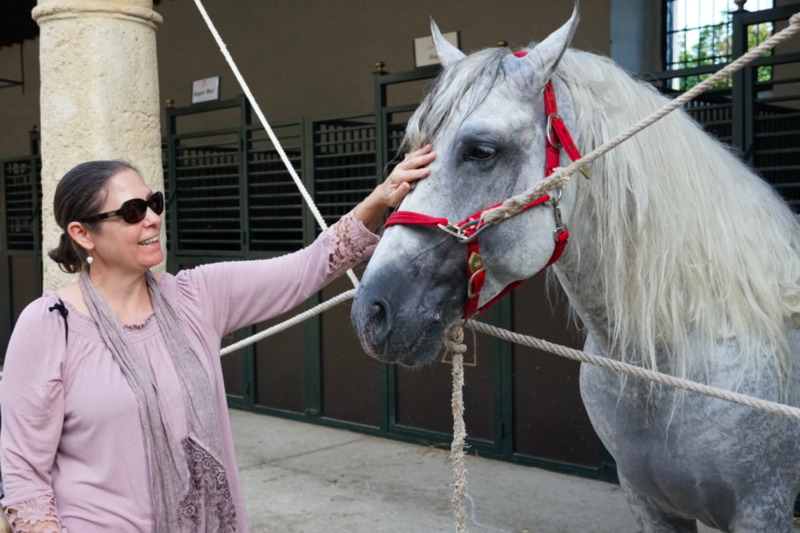 I must say this was a pleasant surprise and we thoroughly enjoyed our visit to the Royal Stables. 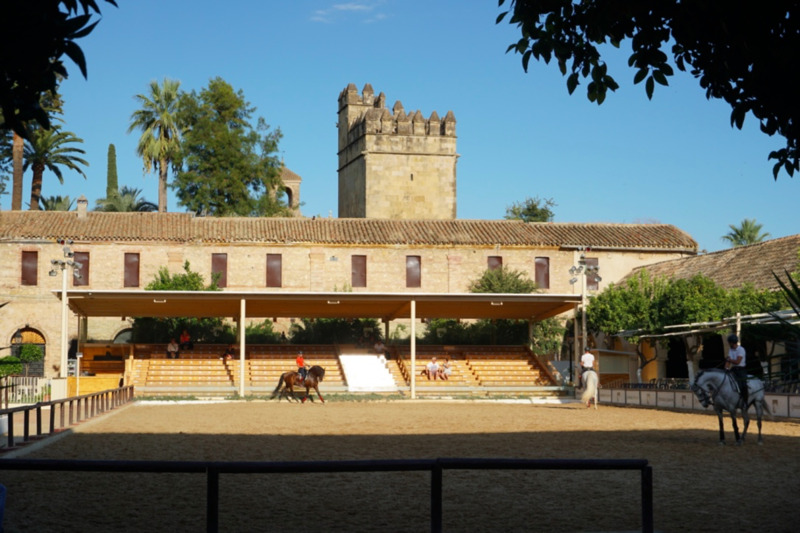 As a lover of Horses, King Felipe II had the Royal Stables built in 1570 on the grounds adjacent to the Alcazar. The Andalusian horses have both Arabian and Spanish roots, but today this strong and elegant breed is considered the “Pure Spanish Horse”. If you love horses, I highly recommend a visit to the Royal Stables and taking in either the practice session or the equestrian show. With everything centrally located around the Mezquita on the banks of the Guadalquivir River, you will eventually pass through or by the Gate of the Bridge. 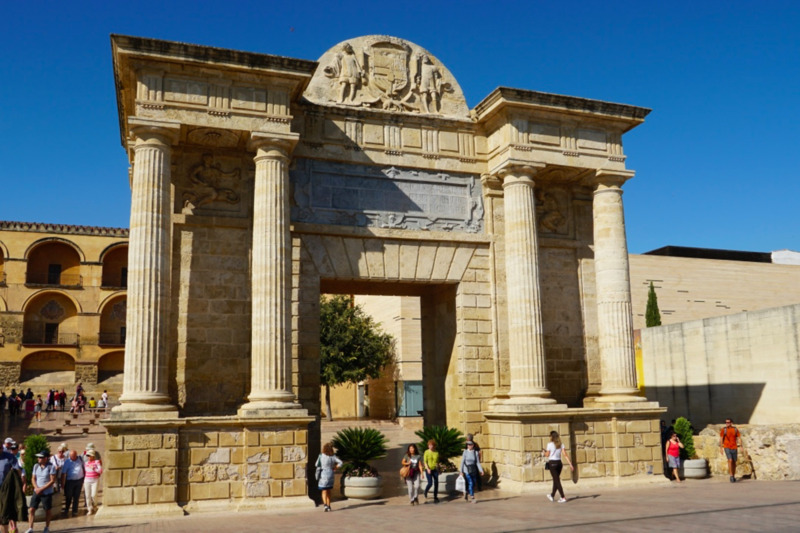 Built by the Romans in 1572, it was one of many entrances into Cordoba and today guards what is known as the Roman Bridge. The bridge, built by the Romans, dates to the 1st century BC and has undoubtedly been reconstructed and restored over the centuries. Take a walk onto the bridge for great views of the Mezquita and the Gate of the Bridge. 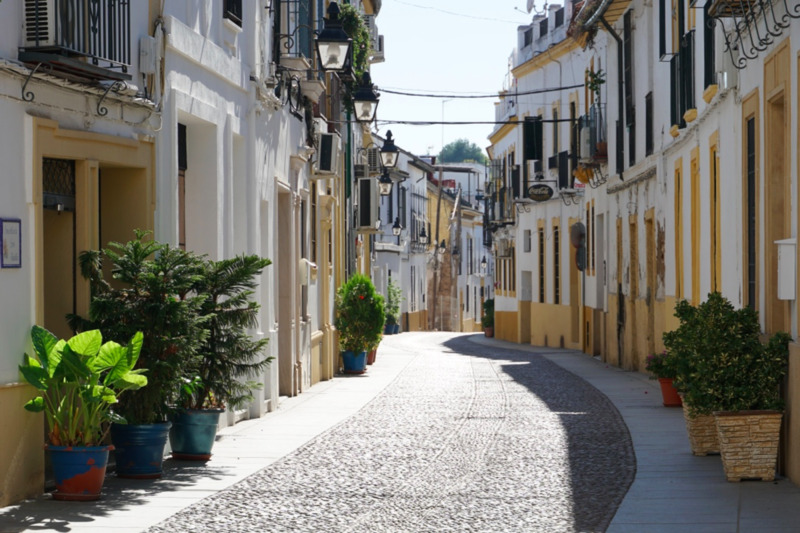 Before calling it a day, be sure to check out Cordoba’s Jewish Quarter. 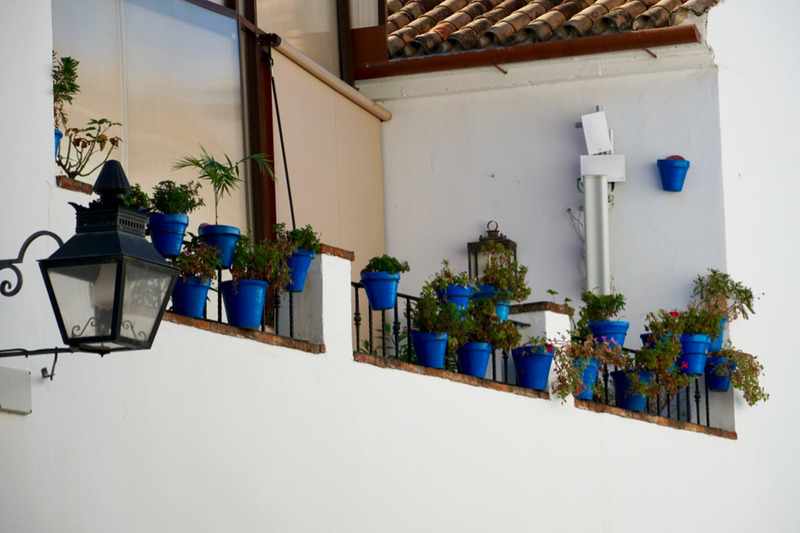 Located in the streets just to the northwest of the Mezquita, this quiet neighborhood is an interesting collection of narrow lanes and Moorish architecture. Walking tours are available, or you can simply wander through this historical section on your own. Be sure to stop at the Cordoba Synagogue; built in 1315, it is one of the few pre-expulsion synagogues still standing in Spain. The Jewish Quarter is part of the historic center of Córdoba, and was designated a UNESCO World Heritage Site in 1984. If you’ve spent the better part of the day in Cordoba, you will have to eat at some point. Just north of the Mezquita is a great little place called Bodegas Mezquita. Normally we would avoid places that are close to tourist attractions, but this place has good reviews, was convenient, clean, reasonable, and the service was exceptional. My wife tried the Gazpacho, which was excellent. Our waiter, Manolo Rodriguez, was perhaps the best waiter I have encountered in all of my travels around Europe. Ask for him and you will not be disappointed. Hopefully, this helps you if you are thinking about making a day trip to Cordoba. It’s easy to do utilizing the train, and once in Cordoba, everything is within walking distance. From the train station to the Mezquita is a little over a mile (1.8 km), which is certainly doable, but if you want to save your legs, just hop in a taxi and you’ll be there in no time, less just a few euros. I can’t say enough about the taxis in Spain: friendly, honest, efficient, and very, very reasonable. 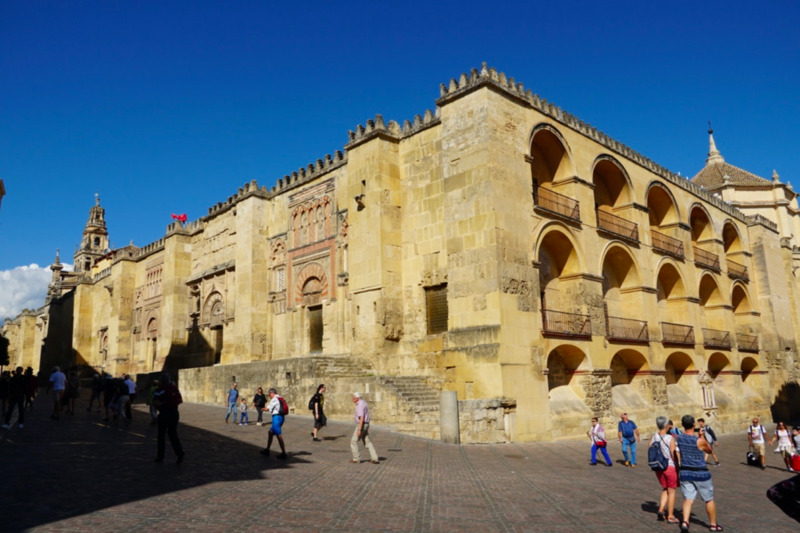 No matter how you spend your time in Cordoba, I think you will find it a fascinating place loaded with history, interesting architecture, and of course the incredible Mezquita. Thank you Liza. Córdoba is incredible, you will love it. The Mezquita is a one of a kind place, definitely worth the effort to see it. Thanks for stopping by and commenting, have a great day. 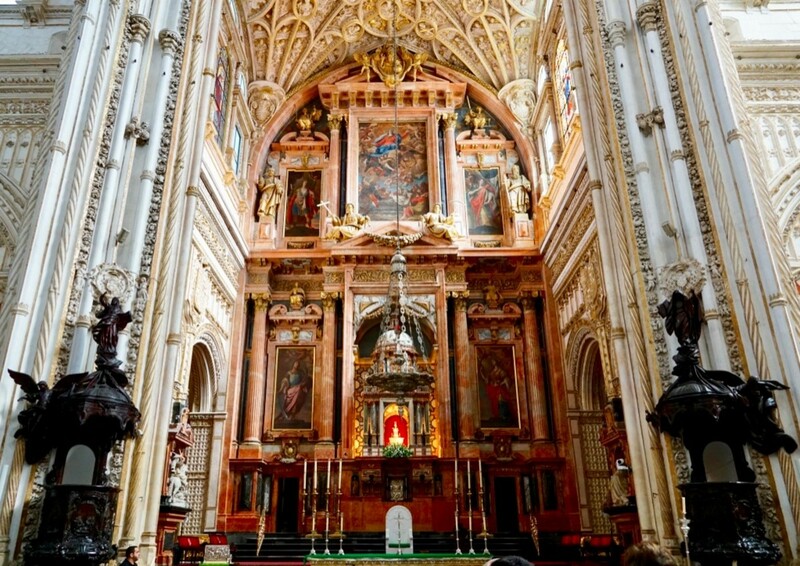 I was astounded looking at the extraordinary architecture of Cordoba. Thank you, Bill, for sharing this well-written article during your visit to the city. 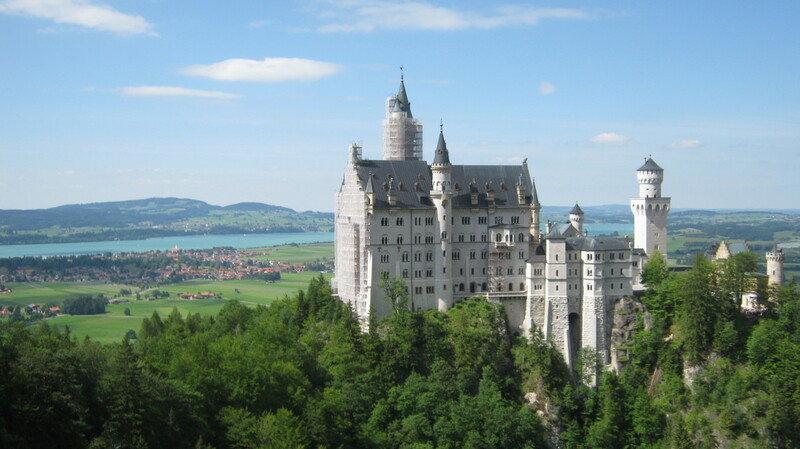 I wish someday I can go with my husband because we love historical and wondrous architecture. Thank you Thelma. 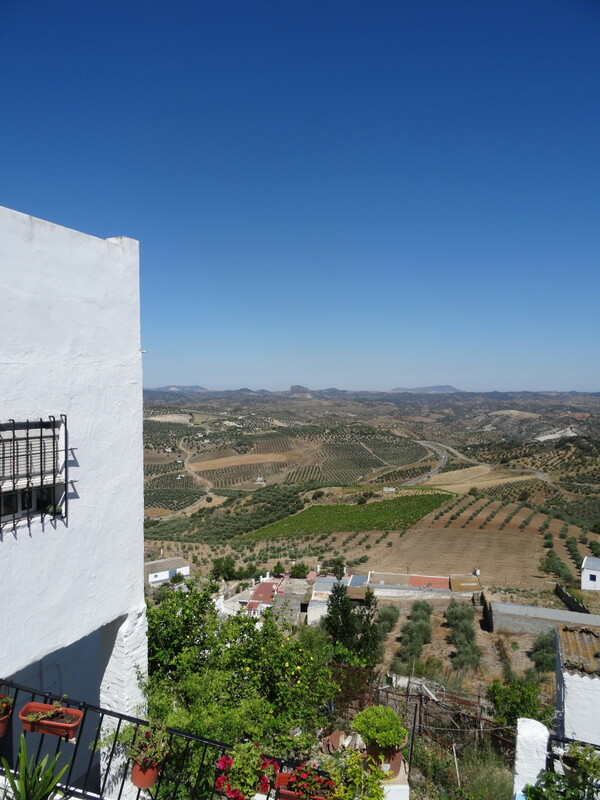 We really enjoyed southern Spain and Cordoba was a wonderful day trip. Seeing the Mezquita was an amazing experience. Have a great day and Happy New Year to you. What a beautiful place to visit! Thanks for the wonderful photos and the tour you have made. How I wish I can visit there one day. Thanks for sharing this very informative hub. Btw, Happy New Year 2019. Thanks Suhail, no problem, and I appreciate the nice words. Have a great day. And, Bill, I apologize for forgetting that it was a great hub. The write-up plus the pictures were awesome. Hi Suhail. Thank you. Both Córdoba and Granada were an amazing experience. That’s wonderful that you will soon be visiting with your family, I’m certain that you will love it. What a beautiful poem, thank you for sharing it. 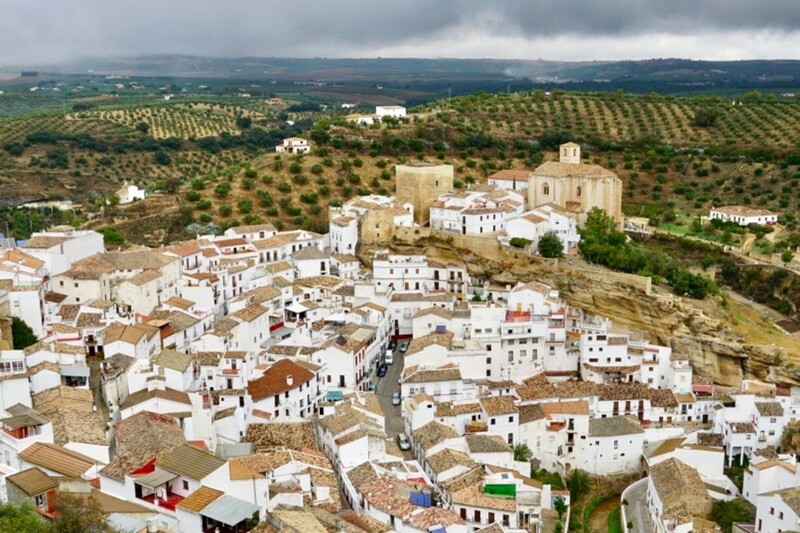 Almost every Muslim like me, at some point, wants to visit Andalusia and especially Cordoba (called Qutabah in Arabic / Persian / Urdu / Turkish, etc.) and Granada (Ghernata). I will be there soon with my family. I will also like to share that our national poet Sir Allama Mohammad Iqbal, visited Andalusia in early 1920s, and prayed at Masjid Qurtaba that was especially opened for him to let him pray. In those days, prayers were not allowed in the mosque area. He wrote a beautiful poem in Urdu while in the mosque. Thank you Heidi. 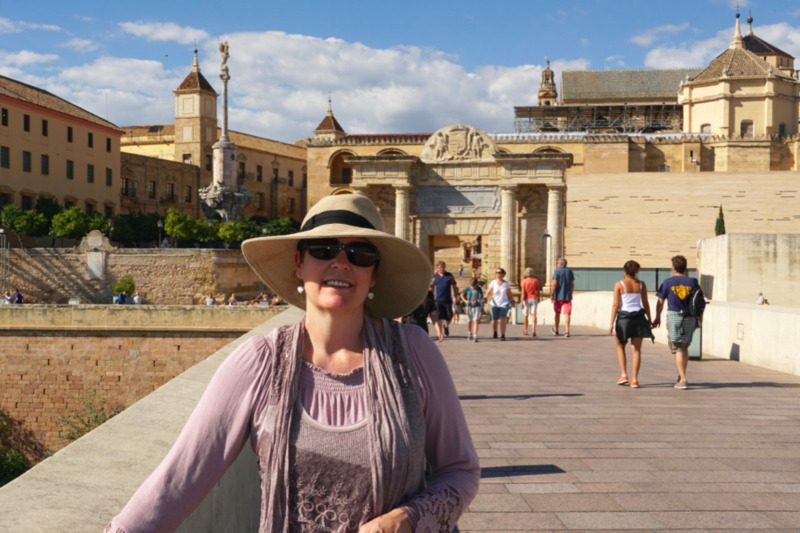 We really enjoyed Spain, especially our day in Córdoba. Glad you enjoyed the tour. A Merry Christmas to you and yours also. Since it would take more than a day trip to get there, luckily I have your lovely photos to suffice. :) Beautiful! Thanks for sharing your art with us and Merry Christmas! Thank you Linda. Visiting Córdoba wound up being a great decision. It was easy to get to and the Mezquita and surrounding area really was amazing. 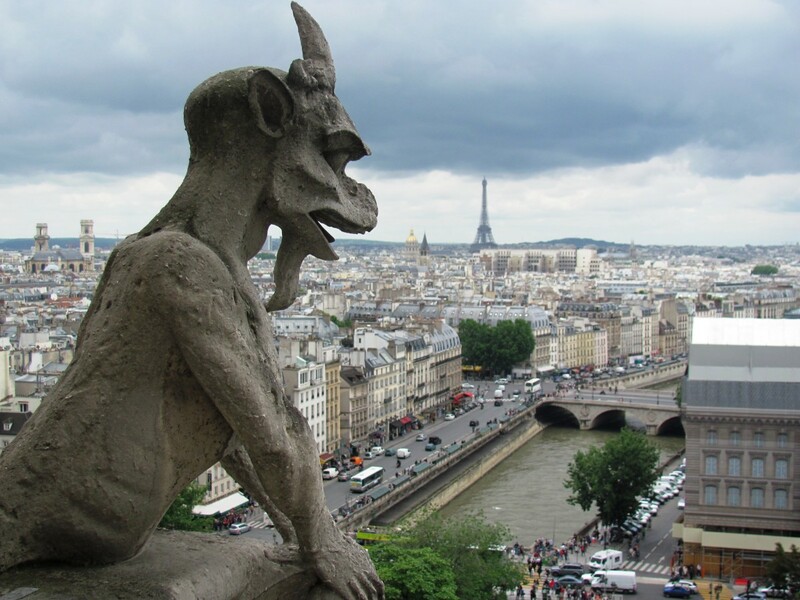 Thankfully the Christians had the sense to save the mosques, synagogues, and architecture after their conquest in the 13th century so that future generations could enjoy it. Have a great day. What a great place to explore. I know I often say that I would like to visit the places that you describe, but I always feel that way after reading your interesting travel articles and looking at your beautiful photos. Hi Flourish. Thank you. I am blessed to be able to travel to these places. Spain was very impressive, friendly locals, clean, and amazing architecture and history. As someone who tends to overplan things our trip to Córdoba was a welcome relief and super easy. Thanks again, have a wonderful weekend. How very fortunate you are to be able to travel to such amazing places like this. In addition to noting the beautiful architecture and blue skies, I am impressed at the cleanliness of the place. I was glad to see that a lot of planning wasn't needed for this side trip and that cash was king. You don't often see those things. Thank you Liz. Looking back it would have been nice to spend a night in Córdoba, but we did thoroughly enjoy our day there. Quite an amazing place. Thanks for stopping by, have a nice day. I have read your article with great interest as we did the same trip a few years ago. The only difference was that we stayed a night in Cordoba. I agree with all that you say. Cordoba is well worth a visit. Thank you Bill. This is certainly my niche, writing anything other than travel articles and I struggle. I wish I had your creative gift. A wonderful weekend to you also. This is you at your very best as a writer. Some people, like you, seem to write travel articles effortlessly, while writers like me struggle with them. To each his own, my friend. A job well done. Thank you, Pam. 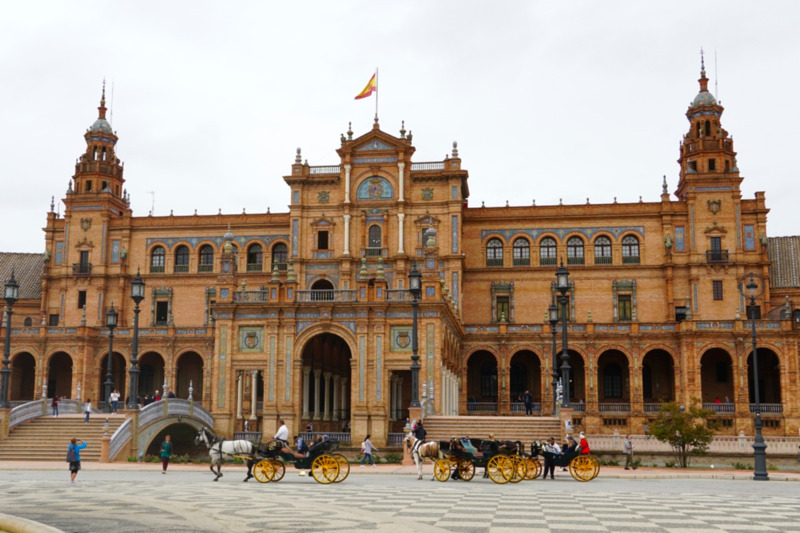 Southern Spain is loaded with history and wonderful architecture. We very much enjoyed visiting Cordoba, it’s an amazing place. Have a great weekend. I truly enjoyed all your pictures and the information about each ancient place you visited. The architecture is gorgeous. I would love to visist. Thank you Emma. Córdoba was an amazing place to visit. The Muslim influence is what makes it such an interesting place, and of course seeing the Mezquita was a wonderful experience. Have a great day. Muslims have built a great civilization in Andalusia for eight centuries since the entry of the Muslim Commander Tariq ibn Ziyad. Thank you for this useful and beautiful article. I would like to visit Cordoba to see this unique architecture.